We are inching closer to August 9th, the scheduled official announcement of the Samsung Galaxy Note 9, and new leaks are emerging for the upcoming Samsung flagship. The latest leak comes from Chinese leaker @UniverseIce, who has a good track record as far as Samsung flagships go. This image is from the marketing materials of the Galaxy Note 9, and it showcases several aspects of the device. First and foremost, the new Bluetooth S Pen takes center stage in its golden color. The image does not show off the Bluetooth functionality, obviously, but we know from previous FCC filing that the new S Pen will indeed support Bluetooth to allow users to take photos and control music. There does not appear to be any significant changes to the design of the S Pen, though the dimensions of the accessory could have been altered to be better accommodated inside the phone chassis. The promotional image also confirms the new camera placement on the back of the device that appeared on renders previously. The fingerprint scanner sits below the horizontally placed camera module (with dual cameras too), leaving more room for a large battery, which reports suggest could be as large as 4,000 to 3,850 mAh. The Note 9 also features a USB Type-C port, a 3.5mm headphone jack, speaker grill, and the slot for the ejectable S Pen. The leak also shows off the blue color variant of the Galaxy Note 9. The S Pen is golden in color, which seems like a very odd combination to go alongside a primarily blue color with no other gold accents. Perhaps the UX of the phone could be themed suitably, to give more reason to Samsung’s color choice. 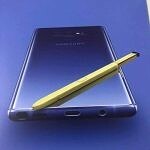 It is also unknown if the S Pen will retain the golden color for all color variants, even as Samsung’s teaser image sports the golden color for the S Pen.